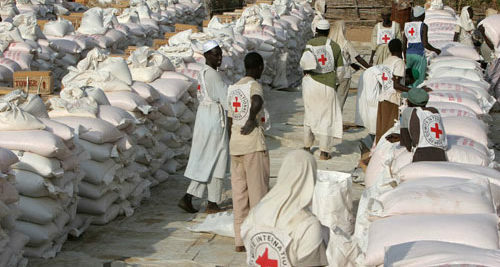 Treating and caring for the wounded and sick in armed conflict, other major violence and natural disasters has always been bound up with the history, identity, values and reputation of the International Committee of the Red Cross (ICRC). Providing health care is a challenge in times of armed confict, when the infrastructure of a society collapses and violence leads to increased demands for care. Through its hospital programmes, the ICRC has an obvious role to play to help people in such situations. Adequate hospital care close to where people live, and with good links to primary health care, rst aid and physical rehabilitation services ensures an essential continuum of care. A nutritionist analyses the access a given population has to food. He or she assesses interruptions in the food supply chain such as a bad harvest, and the impact this might have on the nutritional status of a population.Whenever there is a breakdown in the food supply chain, the nutritionist helps determine the most appropriate intervention to increase food production and to create livelihood opportunities. Examples are seed and tool distributions, agricultural services like ploughing or a livestock programme. The treatment of acute malnutrition, for example, through supplementary feeding, is also part of the nutritionist’s responsibility.